This puzzle I created for 10th 24 hour Puzzle Championship. 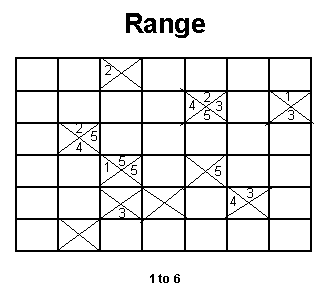 This puzzle type also appeared in Oguz Atay Puzzle Contest (OAPC). Place digits 1-6 in the grid so that no digit is repeated within a row/column. Numbers in the diagram indicate the difference between the biggest and smallest digit in the visible cells. A digit can seen others until its view is blocked with a triangled cell. If there is only one cell in sight, the number indicates the digit itself. No cell may remain empty.